We’d love your help. 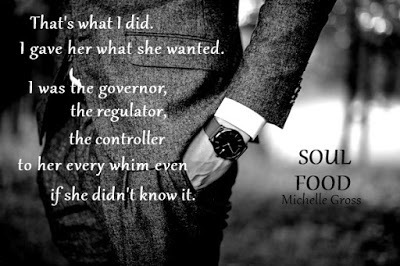 Let us know what’s wrong with this preview of Soul Food by Michelle Gross. In a game of seduction, Ruth thinks she can enjoy a moment of lust, if only once, before the With no choice, a human bargains her soul for ten years of music and song. To ask other readers questions about Soul Food, please sign up. What happens when a soul reaper and human cross the love divide: An epic love story that's what. 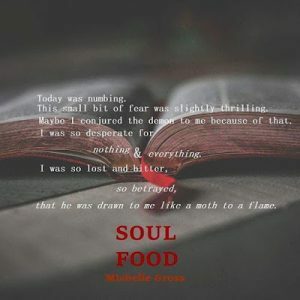 So I absolutely adored Soul Food: while not my first book by this author this one was my hands-down favourite: quite a feat in itself when I also loved my other toe-dip into these waters. Set in the same world as bewitching Sloth (which is my other read by this author ) this is very much a loosely connected standalone. 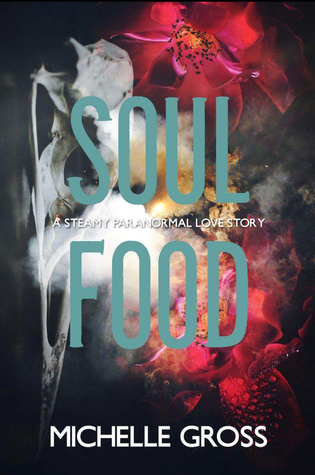 Soul Food tells the story of Soul Reaper Amit and Rap singer Ruth AKA Soul Goddess/ Dark Goddess. When Amit is drawn to Ruths bright Soul: the essence he survives on he offers her a deal ten years to live her dream before he collects his soul food. Well, what follows was such an entertaining, steamy and engrossing tango of an unusual courtship that I bloody adored. The interaction between Amit and Ruth was so surreal. Amit was such an odd broody contradiction of extremities and the absolute complete opposite to Ruth. Watching him bluntly deadpan his responses to Ruths wishes was so entertaining especially because he was so completely serious in all of his answers. His complete bafflement in normal everyday situations and interactions was so amusing to behold. And his catchphrase I want what you want: priceless. made me chuckle when he told Amit off for playing with his food. I find this very unfair Sire, Whats Unfair? You told me not to play with my food and that's exactly what you're doing. This was a unique paranormal romance that I consumed in one entire sitting. I have no issues at all recommending this one it was fantastic from start to finish. I voluntary reviewed an Arc of Soul Food. Let me start by saying that my rating for this book is 3.5 stars. The storyline was original and definitely piqued my interest. Something was missing though. Soul Food is a good book it just didnt mezmorize me. Ruth and Amit's story is interesting and the book is easy reading. Take a chance, buy it and enjoy. This is the second book I have read by this author and quickly she is becoming a new favorite of mine. Ruth is given an opportunity to follow her dreams and live life to the fullest. Sounds amazing, except it has an expiration date. So that is what she does. Music fills her soul with happiness and she becomes a star. But for that she has, she is humble and a little bit lonely. She is also weary of others because nothing brings the worst out in people as jealousy. Emit is the president of Black Hearts and has watched Ruth transform into the vibrant singer that she is today. He has gone years without ever meeting her face to face but once they finally do meet life is about to get a bit more complicated. For all of Emit's attitude and coldness, Ruth can't get enough of him. Emit has his own agenda and he is determined to control the situation to the very end. A interesting cast of characters brought this story to life. The chemistry, even when only one-sided was off the charts. The ticking of the clock added an interesting dynamic to story and our characters. There was a little bit of drama, some suspense, a few deaths and whole lot of soul. Ruth was a strong character who went after what she wanted with a feisty attitude and a tremendous heart. Emit was quite the jerk upon first meeting. But for all of his aloofness he grew on me and even made me giggle. While the main characters stories finish, there is other things left open and I hope that those things are revisited in the future. This was a solid paranormal story and regardless of what comes next I'm all in. Read the first chapter and stopped. Writing style isnt for me, as it's a little too naive for my taste. Ama Crimson eyes blinked from the shadowy man. There was a shimmer in his silhouette, like maybe he was moving closer. There was no mouth or eyes. Nothing. Just a shadow with burning red eyes. Michelle Gross is quickly becoming a favorite author of mine. She has a way with words that makes everything around me disappear and I can only focus on what she is saying, on the story she is telling. Soul Food is not like any other books I've read, which is a relief. Paranormal seems to start all sounding the same when you've read as much as I have. Michelle Gross brings us different and just as magical. Soul Food is gritty, sensual, and raw. Ruth wants to make it so bad as a singer and songwr Michelle Gross is quickly becoming a favorite author of mine. She has a way with words that makes everything around me disappear and I can only focus on what she is saying, on the story she is telling. Soul Food is not like any other books I've read, which is a relief. Paranormal seems to start all sounding the same when you've read as much as I have. Michelle Gross brings us different and just as magical. Soul Food is gritty, sensual, and raw. Ruth wants to make it so bad as a singer and songwriter, after a huge betrayal she runs into a Soul Reaper. He promises her fame for her soul. She takes the deal and agrees to 10 years before he comes for her. Those 10 years are some of happiest for her, she truly only cares about music. She just wants to make music. Ruth surprised me with her resilience and acceptance over everything. She is so likable. You understand all her troubles. Yet the way she continues to find acceptance is remarkable. Amit has no idea what he's doing. He thought he was making a soul happy and bright to eat. The more time he spends with Ruth, the more they both fall in love. Amit is described as cold and aloof, and honestly that's the best way to describe him. I loved seeing him slowly open up to Ruth. Soul food was such a intriguing story in pulled me in a kept me hostage till the very end while also leaving traces of it . This would be the first book that I have read by the author Michelle Gross and let me tell you it wont be the last the will enter my kindle . The way the characters grew though out the story and the way the couple connected the attraction couldn't be stopped even though it was fought tooth and nail . I can't wait to read more by the author and hopefully see more of the char Soul food was such a intriguing story in pulled me in a kept me hostage till the very end while also leaving traces of it . This would be the first book that I have read by the author Michelle Gross and let me tell you it wont be the last the will enter my kindle . The way the characters grew though out the story and the way the couple connected the attraction couldn't be stopped even though it was fought tooth and nail . I can't wait to read more by the author and hopefully see more of the characters in the future . While I am not usually a big fan of the paranormal, I so enjoyed this story. I couldn't get enough once I got to know Ruth and Amit. Ruth was a girl trying to make her dreams of a music career come true and Amit was in the right place at the right time to offer her a deal she could not refuse. I would recommend if you are a fan of paranormal romance, gives this book a spin, you won't regret it. What happens when you want revenge? When people you thought you could trust people but they still all your stuff. You meet a Soul reaper and offer him your soul in exchange for 10 years of happiness and all that you want. However what happens when feelings start to grow? One heck of a story and OMG this was one heck of a story loved it. What the hay in a horse barn? 4.5 wow.... ho letto qualcosa che arriva dritto al cuore e allo stomaco, e che non andrà nel dimenticatoio, assolutamente no. An amazing book. Great characters and awesome story lines that keeps you wanting more. I could now put this book down, I had to see what happened next.